On our PFF Premium Stats page, you can see each team’s grades in a variety of categories. The process is pretty standard. The best grades are bright, deep blue; the worst are a dark orange/red; the numbers in the middle fall at various corresponding spots on the gradient. See the colors without the numbers and you still get a pretty good idea of how a team did. The Texans’ line in 2018 was comical. The team was good. The Texans’ grade line is mostly populated with strong greens and blues. Their tackling grade on defense was a yellowish 62.7. And then it’s the run-blocking grade. 43.1 It’s a strong orange. Only two units around the league — the Browns’ tackling (34.8) and the 49ers’ pass coverage (37.6) were lower. So Deshaun Watson could have been a world-beater in his return from injury (he was), and DeAndre Hopkins could have cemented his place as maybe the league’s best receiver (he did), but the team’s running backs, led by Lamar Miller, were already middling and didn’t get much support. Offensive line isn’t the only thing the Texans need to address this offseason, but it’s the biggest thing. As mentioned in our full-league offseason wish list, there aren’t many moves we’d like to see more anywhere from a fantasy perspective than the Texans revamping maybe the league’s worst offensive line. Miller’s 4.6 yards per carry was 23rd-best in the league among qualified running backs, but his after-contact average of 3.2 yards was 16th, meaning he only got 1.4 yards before contact. 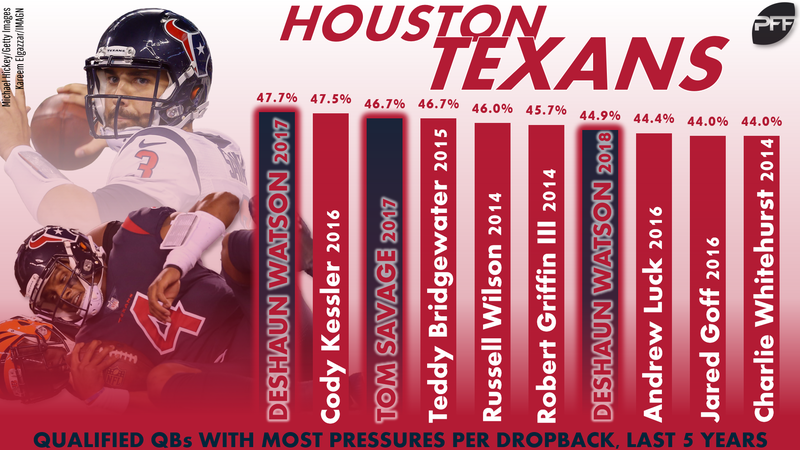 Meanwhile, Watson has led the league in percentage of dropbacks under pressure in both of his two seasons (and Tom Savage was second behind Watson in 2017), so even though the Texans’ line graded better as a pass-blocking unit in 2018 than they did blocking the run, there are miles of room for improvement. Does that mean using the team’s ample cap space (they have the sixth-most, per OverTheCap) to sign as many top-tier free agents as they can convince to come to Houston? Or should the team dive in on the position in the draft (three picks in the first two rounds)? Yes, and also yes. After years of eschewing offensive line help, the Texans should be using every avenue to revamp the line this offseason. Watson deserves it. Miller has been … fine as a Texan. He’s been an RB2 all three of his years there, if only because of quantity. But there is ample room for improvement from that position, and while there will be teams with more cap space and more urge to sign Bell, Houston should at least dip its toes in the water and see if it gets any bites. The main expenditures this offseason should be the line and the secondary, but if the market for Bell isn’t as robust as the running back clearly thinks it will be, the Texans might be able to justify it, letting Miller go. Failing that, the Texans could dive on the Coleman grenade in free agency, though from here he has many of the same warts that Miller has already shown. Still, the team has one of the league’s most electric QB/WR duos and should be getting Will Fuller back healthy as a stout No. 2. It’d be a shame to have all that excitement in the receiving game and complement it with “eh, fine” in the backfield. Jordan Thomas had a big game in Week 8! He had two touchdowns! He finished third at the position in fantasy scoring that week! The Texans as a team had two other tight end touchdowns. All year. Worse yet, all three tight ends (Thomas, Ryan Griffin, Jordan Akins) struggled as blockers, particularly as pass-blockers. In the spirit of fairness, both Jordans were rookies at a position that historically calls for more than a season in the league to develop. Still, tight end was pretty clearly an area of weakness for the Texans in 2018. Signing a James or a Seferian-Jenkins wouldn’t solve the team’s receiving problems at tight end all on their own — neither guy has a “top of the position” profile. But both are better receiving options than currently hold down the position in Houston, and both are significantly better blockers than any of the existing group. Blocking, you might have heard, is something the Texans don’t do well.